Part of Walmart’s success over the years has been the vast array of products sold in its stores and online. The same could be said for Amazon with its 480 million items sold online. Each retailer has a robust offering of branded products, and while they may be seen as a house of brands, they also continue to expand and invest in their private label, on everything from aspirin and apparel to window fashion. Private brands are not new to Walmart, who has some of the most highly visible items in customer’s shopping baskets, according to a recent report by Fayetteville-based Field Agent. The report found 84% of customers shopping at Walmart purchase private brands from the retailer. That was higher than 83% of Kroger shoppers who did the same and 78% of Costco members who favor the Kirkland brand. The report showed Target and Sam’s Club also did well with private brand loyalty, while Amazon only showed 27% of customers buying that retailer’s own brands. The top three reasons consumers said they buy and will continue shopping for private brands is the improving quality of the products, affordability over branded comparisons and more variety among private label offerings, according to Field Agent. When it comes to consumer packaged goods, private label is an often go-to for consumers. Field Agent found 70% of respondents purchase private-label milk, 67% buy paper towels, and 48% buy private-label sandwich bread. Toothpaste (13%), shampoo (18%) pet food (19%) and tuna fish (26%) were the least purchased private-label items, according to the report. Walmart and Amazon have invested more into private brands of apparel, home goods and beauty, which are higher margin categories and considered “long tail” in that retailers typically sell a large number of unique items with relatively small quantities sold of each. 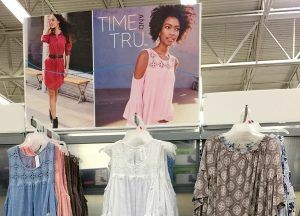 Time and Tru is one of four new apparel brands for women, men and kids unveiled recently by Walmart. Marc Lore, CEO of the Walmart’s U.S. e-commerce division, said more than 200 specialists hired in the past year help the retailer drill down into the long tail categories like apparel and home and specialty. Walmart named Nathan Adrian, a 2012 Olympic gold-medal winner, to oversee the retailer’s swimming category, offering advice and expertise on everything from swim caps to goggles. Walmart recently announced the launch of four private-label apparel brands as it tries to make up ground against Amazon, who has gained in popularity in footwear and apparel. The acquisitions of ShoeBuy, Moosejaw, ModCloth and Bonobos have given Walmart some headway in the apparel and footwear space, but Amazon had a head start, having acquired Zappos in 2009 for $850 million. CoreSight Research recently reported two-thirds of Amazon Prime members (37.4%) bought apparel on Amazon last year, closing the gap with Walmart. Last year 41.8% of those surveyed said they purchased apparel from Walmart, compared to 37.3% of Target shoppers. The report found Amazon customers often chose private brand apparel, with only Nike, Amour Vert and Hanes selling more than the private brands. Keith Anderson, vice president of market insights at Boston-based Profitero, said apparel was one of a few untapped markets for Amazon, which is why the retailer has focused so heavily on it in recent years. He said private label is higher margin, and apparel also helps to carry greater brand equity than other categories. Anderson explained that apparel also is appealing to Amazon because it represents white space in terms of applying technology to help overcome some of the barriers to buying clothes online. Anderson suspects Amazon could be the first to debut a more flexible model for apparel shopping online. He also said Amazon is adept at seeing what is missing in the market, then jumping in to fill unmet needs. He also expects to see Echo Look — which includes a camera — being able to interface with smartphones to help give consumers fashion advice on clothing they already own as well as items they may purchase. Carol Spieckerman, CEO of Spieckerman Retail in Bentonville, said private brands can offer a powerful combination of differentiation and higher margin. Kenji Gjovig, executive with Content Analytics in San Francisco, told Talk Business & Politics/Northwest Arkansas Business Journal that Amazon and Walmart are focusing on private-label brands in apparel because it gives them control of the products in terms of quality, design and pricing, but without giving up margin.